Description: Howea forsteriana is a relatively slow-growing palm, eventually growing up to 10m (33 feet) tall by 6m (20 feet) wide. Its fronds can reach 3m (10 feet) long.Under natural conditions, it grows as a solitary tree. Howea forsteriana has a slender trunk and a graceful crown of dark-green drooping fronds. Indoors, Howea forsteriana will eventually grow up to 2.5m (8 feet) tall with a possible spread of up to 3m (9-10 feet). Its leaft-stalks, which may be grow to 90cm (35 inch) long, support flat-topped fronds tended midrib. 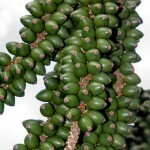 The leaflets are spaced about 2cm (0.8 inch) apart on the extension of the leaf-stalk that forms the rib of the frond and they are held horizontally rather than nearly vertically. The way in which the leaflets are carried affects the shape of the whole palm. Houseplant care: Howea forsteriana is an elegant plant and is popular for growing indoors, requiring little light. It can be grown almost anywhere as an indoor plant. The Howea forsteriana palm will withstand quite dark and dry corners of your house, and will tolerate a degree of neglect. However this palm grows best with good light and regular care. Light: Howea forsteriana do well in either bright light or medium light. An ideal position is one that provide filtered sunlight. Howea forsteriana is a popular palm for indoors as it can tolerate much lower light than other palms. It will tolerate low light but do much better in medium light. 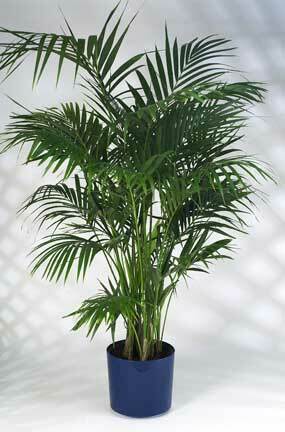 This versatile palm can be used in low to high light environments (from 250 to 2000 lux). If it gets too little light however, it will slowly deteriorate. 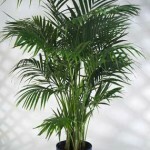 Direct sun can burn young plants, so give Howea forsteriana palms some protection until they are about five years old. 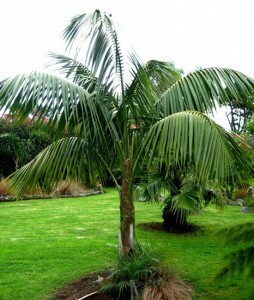 Coastal areas are ideal for growing Howea forsteriana palm outside. Temperature: Howea forsteriana grows well in normal room temperatures and is able to tolerate reasonable dry air. 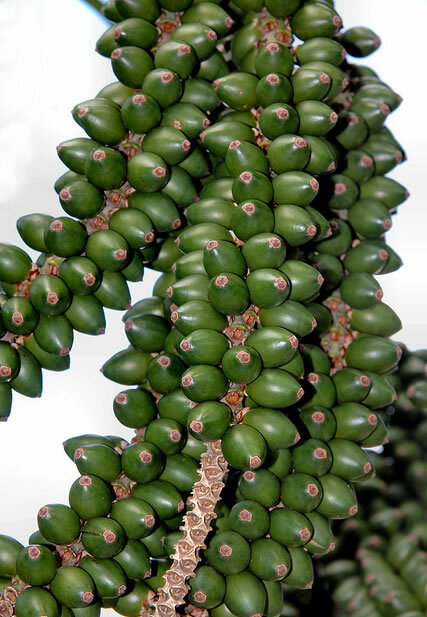 It is better not to expose Howea forsteriana to temperatures below about 13°C (55°F). Outdoors, it prefers a tropical region but will also grow in a cooler climate, and can tolerate temperatures down to -5 °C (23°F), but only for a few hours; normal temperatures should not go below 10°C (50°F). Water: During the active growth period water plentifully, as often as necessary to keep the soil thoroughly moist, but never allow the pot to stand in water. During the rest period give only enough water to keep the mixture from drying out. Do not overwater the Howea forsteriana palm because can lead to root rot. Also ensure that the soil has decent drainage. Under-watering on the other hand can cause yellow tips that can eventually turn brown. Howea forsteriana will benefit form misting to simulate humidity and to prevent pesky spider mites from infesting the palm. Misting will also prevent the dust build up. Also, the Howea forsteriana palm grown as indoor plant benefit from regular time spent outside in a shady and moist position. Such a break will allow rain or hosing to wash the dust from the palm’s leaves, refresh the plant and encourage new growth. Do not use commercial leaf-cleaning products, which may damage the foliage of the palm. Soil: Howea forsteriana prefers well-drained soil that is rich in organic matter. Mulch around the plants or encourage the natural mulch of fallen fronds to collect. Soil pH requirements are 6.1 to 6.5 (mildly acidic). Fertilising: Apply a standard liquid fertiliser to actively growing plants about every two weeks. Outdoors, fertilise Howea forsteriana at least once a year and water regularly, especially during dry periods. Potting and repotting: Howea forsteriana palms will grow slowly in a tub for many years. Use a soil based potting mixture. Move the Howea forsteriana into pots one size larger in late spring every second year until maximum convenient pot size was reached (usually 25-30cm (10-12 inch)). It is essential to press the pot mixture down firmly around roots of the Howea forsteriana palm. To keep plants in the same container, replace old spent soil with new potting mix from time to time. Avoid repotting if unnecessary and choose the right pot size for this palm. Do not choose a huge pot in the hope the plant will grow faster, as it will not! Propagation: Howea forsteriana can be propagated only by sowing fresh seeds and keeping it to germinate at atemperature of 27 °C (80°F). Can be used a heated propagating case. It seems that germination rate is 50% or less. Seedling usually grow very slow. 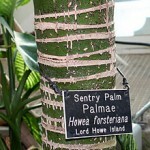 It may take about six years to produce a typical Howea forsteriana palm. 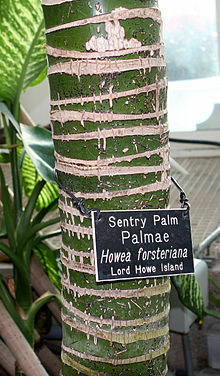 Uses: Howea forsteriana palms look best planted in groves or clumps with palms of different heights growing together. Howea forsteriana also make ideal patio plants or containerized specimens. Problems: Most of the diseases of this plant occur when it is either overwatered or not watered enough and if it’s getting too much or too little sun. They are susceptible to Mealybugs, mites and Scale. You might be tempted to prune your Howea forsteriana palm very often but try to resist the urge. Over-pruning may cause permanent damage to the trunk and may make your palm susceptible to fungal infections.